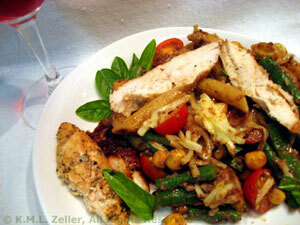 Grilled Chicken, Tapenade, Pasta, Thyme for Cooking easy main course salad. Note cooking time and add beans to water during last 4 minutes. Mix vinegar, Worcestershire, oil and oregano. Pour over chicken and allow to marinate for 10 - 15 minutes. Cook on barbecue grill or in a nonstick skillet, 12 - 15 minutes, turning once. Top and tail beans. Cut into 1 inch (2.5cm) pieces. Add to boiling pasta water during last 4 minutes of pasta cooking time. Tear basil leaves if large. Put tomatoes, chickpeas, tapenade and olive oil in large bowl, mix gently. When pasta / beans are done, drain and rinse with cool water. Add to bowl and toss gently with tongs to combine. When chicken is done, remove, slice and add to pasta. Sprinkle with basil leaves, cheese and serve.